In Feb 2010, I was diagnosed Epithelioid Sarcoma. Multiple tumors were found in my left hand, from fore arm up to the left clavicle and neck. At that time my left arm was double the size of my right arm. Mar 2010, pic was taken 1 month after diagnosed sarcoma. I flew to Melbourne the next month and seek for the consultation from Prof Peter Choong and his specialists team of sarcoma at Peter MacCallum Cancer Center. Prof Choong advised me to go for 18 chemo sessions hoping the tumor around my neck will be gone, then amputate my left hand up to the shoulder. After completing all 18 chemo sessions, with the last review from Prof Choong, unfortunately, tumor near my neck still there and he insisted no point to amputate my arm, and asked me to continue chemo to control my cancer, but it will not be cured. At that time, i knew i was not going to do anymore chemo due to my weak condition and many side effects happened on me. One of the serious side effects was having lung collapse and it happened twice even after the surgery and suction. June 2010, lung collapse happened after 9 chemo sessions. A tube was put into my right lung for suction. Aug 2010, after completing 18 chemo sessions, i was hairless and weak. Aug 2010, it's so sweet to have the nurses from Peter Mac celebrating the last chemo with me. I took the risk to stop my chemo and consider the natural path to heal the cancer. I read books from Dr. Tom Wu who has been practicing the healthy diets to heal his 4th stage lung cancer since 30 years ago, and Dr. Andreas Moritz's book called 'Cancer Is Not A Disease' share many non-traditional healing method to cure cancer. I took their advises and now after a year without taking chemo, and i manage to survive and i feel great about it. Although i am not 100% cancer free, but i see my left arm is getting better and i feel i am healing, and it just needs time. I strongly believe our body has the strongest immune system to fight any of the disease, we just have to feed our body with anything in order to build the army. Our body is a wonderful universal that we might under estimate its power. We must have faith and work on it! 1/2 of cup sour sop(if available) or avocado (once every other day with seed) and you can change or add any other fruit you like for better taste. 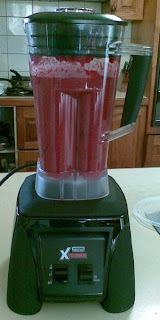 All the smoothie ingredients put inside the blender. My daily cup of smoothie juice. Stop eating any meats and any meat soup which include chicken, beef, pork, lamb, duck. Stop all foods made of flour, bread, pasta, noodle, rice noodle. Stop all kinds of tofu, soy milk and honey, sugar, syrup or any sweet fruits or sweet juices. Stop all fried, deep fried, stir-fried, grilled, baked food. No banana, pear, cantaloupe, honeydew, water melon, papaya, mango. No peanut, peanut butter, cashew nut. a little amino acid soy sauce. **Seeds: fresh ground flaxseed meal and sesame meal, almond, walnut, pumpkin seeds. **Fruits: dried gojiberry, blueberry, kiwi, avocado, old coconut meat etc..
**Each mouthful of salad to be chewed at least 40 times before swallowing. I have been taking Ambrotose product from Mannatech since the day i was diagnosed cancer. Specially taking almost double or triple dose of Ambrotose Powder then the usual people. My cousin surveyed the product and given me lots of testimony how cancer patients survive after consuming the product, she (Peng Chow) is more than happy to share about the Ambrotose product, just give her a buzz. Apart of it, i am taking cactus juice called Millennium (without honey) from E. Excel that claimed to boost our immune system. I am very blessed to have my family support specially my lovely wife who is constantly beside me and love me and taking care of me. Her positive mind influences me a lot. I also blessed to have my 2yrs old son around me, he gives me that 'force' to live and i should live for him. I cannot stress anymore how important that your loves one play the important role during the healing period. June 2010, me and my wife at Melbourne during chemo treatment. Sept 2010, came back from Melbourne, after 6 months separation with my son. Me and my son, same bald head. Nov 2010, Going for morning walk with family. Aug 2011, at mall with family. Dec 2010, me and Shawn Kelly (lead animator for Transformer 3). May 2011, my buddy Phat Phuong (set dressing lead for Toy Story 3) visited me with her girl friend. Those days i am not so much to religion, but after i have the cancer, i started to read a lot about it, and slowly found peace and faith from the religion i believe in. I believe any of the religion you belong to should go for it and you will find faith to overcome the cancer. I was told by Dr. Tom Wu to at least take 20 mins walk daily with sunshine. I also practice Qi Gong and meditation every day. Cancer cells hate oxygen, with exercise our body will breath in lots of oxygen and that will form the environment that cancer cell hates to live in. I have been taking the herbs when i stopped taking chemo, we chinese believe that herbs are the best to support and boost our immune system, and release any toxic that found in our body. Cancer patient body is acidic, that is one of the reason we have developed a cancer! Drinking alkaline water or ionized water helps to neutralize our body, that will cause the cancer cell hard to live in our body which is not acidic. Clinical study shows that alkaline water helps for anticancer. A.I.E.T. stands for Autologous Immune Enhancement Therapy. I was approached by doctor 2 months ago to try this treatment which is clinically practice in Japan over 20 years. Before taking the treatment, some of my tumors started to burst and bleed in yellow fluid. After taken 3 cycles of the treatment, one of the biggest tumor area on my forearm (size around 4cm x 2cm) slowly stopped bleeding and new tissues are growing and the wound is recovering now. Worth to mention few others smaller tumor that burst earlier also recovered. You may want to consult your doctor to seek for professional advise about this treatment. 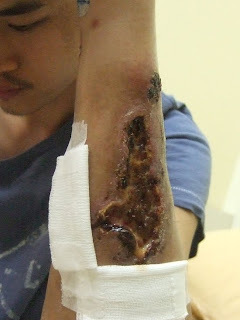 June 2010, form arm sarcoma started to burst. Mar 2011, wound getting serious and spread out. May 2011, wound before A.I.E.T. treatment. Sept 2011, after 4th cycles of A.I.E.T. treatment, wound is recovering. Last but not least, our body listen to our mind, we should always 'believe' we can make it. As the quote said... "If you think you can... you can!" Our body can heal by himself with the strong positive support from his owner. Please do not hesitate to leave any notes or ask me questions or even share your way to cure cancer. I wish you all who have cancer get well soon. We must BELIEVE! God bless you! You are already a great inspiration to all of us who are fortunate enough to live a normal yet healthy life, which can be easily taken for granted. Your 'force' and belief has indeed been the great source of strength and spirit for your survival through the unwavering strong support and love from your wife and child. It would certainly be a great loss if your talent is not passed on and your works not shared. I hope that you still have the burning desire to create great masterpieces that not only thrills the audience but also serves as your fuel to live on for many many more years to come. May God bless your every step ahead. Thanks everyone for the supports :) Cheers! Thank you very much for sharing this valuable experience, it will help a lot of other unfortunate people. thanks very much for this.I wish I knew how to heal cancer as you're are doing when my wife's mother died in 5 months with a terrible lungs cancer. I wish you the best of luck for recovering completely soon. Thanks again you can save people life with this. Loon! I had no idea you were going through all of this. I'm so sorry. Your story is super inspiring and I wish you all the best in your recovery. Keep on fighting! Hi Loon, I am proud of you. It was so glad to meet you recently and thanks for the sharing. I am sure you will recover very soon. The positive force is with you... always! Very inspiring post. Well my mum was a cancer patient couple of yrs ago and she followed exactly what had told by Dr Tom Wu--- changing her lifestyle starting from diet which to maintain her blood pH always at alkaline level. And it WORKS effectively. My mum is currently lives a even more healthier lifestyle than before. And we, as daughter and son are the luckiest 1 because she takes care of us in her unique, healthy and 'organic' way. Wish u all the best in future. I am so proud of you and your constant strength and diligence in your positiveness eventhough sometime it seems so difficult. I was horrified and really saddened by the pictures, as I didn't have the faintest idea it was so so bad, but I am extremely glad of the perseverance you have in taking the steps you are on into your recovery, not so much for your family but yourself. I can't but stress how important you are to me, and that what you are doing has given me lots of faith in seeing you overcome this battle with your illness. I continue to think of you daily and your are constantly in my prayers, that you will come through this with flying colours and that you will gain from strength to strength everyday till you are 100% clear of this very nasty disease. He is resting in peace since 18 Oct 2012. Does anyone know how Loon past away? Was it from the cancer??? Thanks for sharing!! My family and I are looking for the some best sarcoma doctors for my aunts treatment. By your story i am sure they will get some more strength and inspiration. Thanks for sharing Keep Posting! !